Some new teachers are barely earning the national minimum wage because of their pay and the hours they work, the leaders of the National Education Union have warned ahead of a conference set to be dominated by issues of funding and teacher welfare. Dr Mary Bousted and Kevin Courtney, the joint general secretaries of the National Education Union told a press conference this morning that concerns over pay are “rising on the agenda of members” following the government’s unprecedented decision last year to ignore the recommendation of the School Teachers’ Review Body of a 3.5 per cent pay rise for all teachers. Courtney said the union had been contacted by teachers who are earning just over the minimum wage – currently £8.21 an hour for over-25s – and can’t afford to buy clothes or live in London. According to Courtney, a recent survey of London teachers revealed stark choices faced by school staff in the capital. 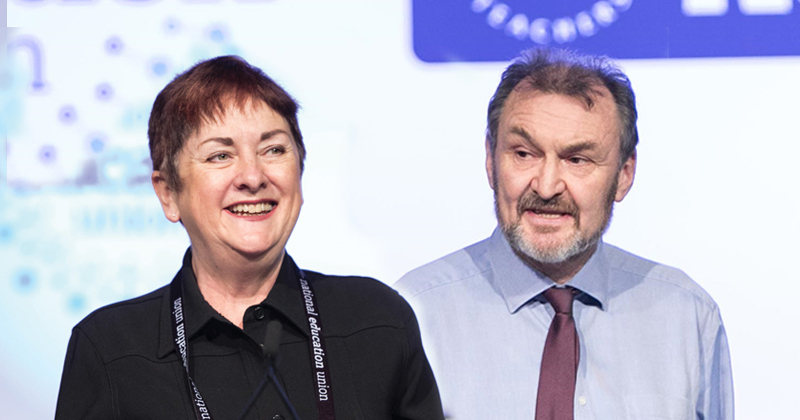 At the NEU’s conference in Liverpool next week, the first since the NUT and ATL officially merged, delegates will debate a motion calling for a 5 per cent pay rise for all teachers and a commitment to strike action if demands are not met. “I think this motion is going to show the anger of the delegates that this is the first government in 27 STRB reports not to implement the report,” said Bousted. “I think you’ll also hear lots of concerns from delegates around the secretary of state’s attempt to constrain what the STRB can do in this next round, giving them a letter saying the award has to be affordable when we don’t know what affordable will be because we’re going into the comprehensive spending review and the secretary of state plucking a 2 per cent figure out of the air. The union has also revealed plans by its executive to amend a motion to the NEU’s conference which calls for a consultation over possible strike action against school funding cuts. Instead of immediately consulting over possible industrial action, as advocated by some members, the executive wants to further develop its campaign on school funding and prepare for an indicative ballot of members to determine what action should be taken. The last indicative ballot did not reach the turnout threshold to move forward. The executive’s amendment does not explicitly mention strike action, but Courtney today insisted that did not mean it was off the table. “We wouldn’t agree that the language is watered-down. We will consult members when we think it will work and when we think we can use it to take the campaign forward. Delegates will also debate two motions which call for the abolition of Ofsted, which Bousted said reflected the concern about the impact of inspection on NEU members and over the new inspection framework, set to come into force this September. Motions on academies, SEND funding, workload and teacher supply have also been tabled. The union has also announced that the Labour leader Jeremy Corbyn will address the conference in Liverpool next week, though his appearance will depend on parliamentary business. A DfE spokesperson said teachers got the “biggest pay rise” in almost a decade last summer, with classroom teachers the “big beneficiaries”. “Whilst we know pay is an important issue for teachers, there are also other factors which can affect recruitment and retention, which is why this year we unveiled the first ever integrated recruitment and retention strategy in England,” they added. In the context that teachers are having to acquire £45k debt to get their degree and more on top if they want to acquire teaching qualifications for some subjects , teaching is poorly paid. In the north east here we have the Tyne and Wear metro. Drivers have to be over 20 they get pains £17.5 k for training then onto £35k. No degree . These drivers are getting headhunted by other train companies and earn £50 k or more. I had to work 10 years completing all manner of PM to get through UPS and earn £35k . If you look at TES jobs international schools are taking NQT on and I have seen a conference with Sir Michael Wilshaw that international schools are the greatest threat to our education system . Not disputing that teachers’ salaries should increase, which seems beyond argument. Mr. Watson. I agree re SW. However what do you think M.B. should take home? If she took less would her stance be more valid? Does opposition and dissent become invalid if rewarded? In relation to the point I’m making, my opinion on MB’s salary is not relevant. I’m simply saying there should be consistency. If Schools Week believes it is appropriate to quote an Academy Trust CEO’s salary when reporting their opinions, or when they interview them, then it should apply the same approach to union leaders. However, addressing your question I don’t believe that the level of salary should be relevant to whether someone’s point of view is valid. I don’t think for example that MB’s comments are half as important as Len McCluskey’s simply because Uncle Len receives £60,000 less than MB (despite Unite having over 8.5 times as many members as MB’s old union). Or alternatively that MB’s views are more important than Paul Whiteman, simply because Paul pulls in a frankly whopping £191,325 from the NAHT despite having less than a third of the members. It’s also for example why I questioned in a recent Schools Week story, about a school that had been found to have serious regulatory failings, why it was relevant to make such a big splash about the fact it charged £45,000 fees. A serious regulatory failing is just as important and relevant if the costs of attending a school are £1 million or zero. As for what I think MB, and indeed the other ‘establishment’ teaching union leaders, should be paid, I would suggest that they are paid significantly higher than leaders of other unions. These figures come from the 2017 Annual Returns, other than the NUT which come from the 2016 Annual Returns. Because the NEU is a new union they won’t be publishing any information until 1 June. Also compare it with Voice (the union previously known as the Professional Association of Teachers). They have 20,503 members and pay their general secretary £67,814. It’s not for me to say what MB should be paid. But if I was a member of a union whose leader was constantly talking about how other people (Academy CEOs) were being paid large amounts of money without clear and transparent justification, where that pay is a big multiple of what the lowest income level is, I think I’d want my union to be a bit more open and transparent about itself. I left teaching (a job I loved) after seven years. In my final year, I kept a time sheet for a whole year, deducting four week’s holiday pay + bank holidays – which is what anyone in any other profession would get – and dividing what I earned by the hours I had to work and it came out at £8.35 an hour. I think our young people deserve to work with people that genuinely love working with them but I needed to feed (and spend time with) my own kids and the job left me being able to do neither.